Kejriwal’s Aam Aadmi party will face more splits? Very likely, if what the insiders revealed on the national meet are true! Kejriwal’s politics is no different from others? Congress, the oldest party! Aam Aadmi, the newest party! What is the difference between them? One is seen as one-person-centric. Kejriwal’s new party is also fallen into this trap? It seems so. Indian political scene is however, changing, no doubt. But the Indian political parties, the political culture seem the same. The major three parties, the ruling BJP, the highly weakened Congress and the new star on the political horizon, the Aam Aadmi party are all seem to be caught in the one leader-centric cult politics. This is no evolution of a new democratic culture. Just the reverse. There is cause for worry. Intellectuals must worry and debate. Led by Arvind Kejriwal and the new Chief Minister of the Delhi Union territory and the flavour of the season politician have all one typical characteristic, they all behave as if the political calling is still a feudal culture. And a personality cult built around the party chiefs. Once in power, the sycophancy becomes a cult! Indian democracy? Yes, the Indian democratic culture is rather very vibrant. The whole world sees India as a very successful practising democratic state and society. Yes, we have to remind Indians themselves, how we are lucky in that respect. See China or for that matter Russia. They are very different societies. No democratic features there. No Opposition party either in China or even in Russia. How the Opposition leader in Russia cans can be shot down and yet we are asked to see Russia with a Parliament, elections and political parties. So, we are lucky to have a democratic political culture. It is only in this context the sudden crisis that had overtaken the newest party in India calls for some deeper analysis and a few questions. Yes, there are problems for India’s democratic polity. When we compare now the democracies, the UK,USA and European countries like France and other ones with our own there is much to celebrate and self-congratulate ourselves. But then see what is the other side to Indian democracy and the Indian political parties. 2014 Lok Sabha campaign: a new high or a new low? The 130 year old Indian National Congress is now in a sad state. The party lost the 2014 Lok Sabha (Lower House of Parliament) saw the not so old, BJP party under Mr.Narendra Modi ran a US Presidential style of propaganda concentrated on the one person, Mr.Modi, money was spent like water and the man himself was not free from flaws, he went for the most ‘crude, vulgar, cheap and coarse campaign’ in the words of a seasoned political commentator, Mr.Harish Khare in his latest book(How Modi won it, notes from the 2014 election(2015). Of course, Mr.Modi won it in an unexpected way, as Mr.Khare himself notes because the Congress, as an established party for long and accustomed to rule by a variety of coalition partners and of course at the end of its regime, the Congress coalition presided over by Dr.Manmohan Singh became a byword for large scale corruption scandals and sheer cynicism. The projection of a greenhorn Mr.Rahul Gandhi proved a disaster. The Youngman failed to live up to the expectations of everyone. The BJP also proved to be a party with no difference. It had long claimed to be a party with a difference, there was of course internal democracy in the party. There were many leaders and they all asserted themselves at times. There were elections and many leaders held the party presidentship. Unlike the Congress which under Sonia Gandhi progressively degenerated into a coterie of one family and that too under Sonia and son Rahul, both proved to be utterly unequal to the challenges of the times. The party stuck to a formula and Sonia, never proved her capabilities and now, proved her dogmatic belief in her destiny to rule over the party. So, in this context came the newest of the new party in Indian politics. The Aam Aadmi party (AAP), came with the slogan of common man and under Mr.Arvind Kejriwal a party that raised great hopes for a new type of politics, it promised an alternative politics. In its second stint it won a massive victory in the Delhi Assembly elections, winning 67 MLAs out of 70! This simply stumped Mr.Modi and his newly strident march towards what seemed to be an unstoppable race towards a near monopoly over power in the country. To put it bluntly, there were widespread apprehensions that Mr.Modi might even emerge as a dictator to pose a threat to the Indian democracy. Now, Mr.Kejriwal, within among after he took over as Chief Minister finds himself in the midst of a crisis within his own fledgling party. AAP is a new party and its members, leaders are all young and educated and highly idealistic. What gave the AAP its new glow is the idealism of its youthful leaders. Then, why such a sudden split? In the latest crisis, on just the other day, the Political Affairs Committee (PAC) with just 21 persons met on the outskirts of Delhi and sought to diffuse the internal party crisis. The reason for the crisis is that two of the founding members of the party, namely Mr.Prashant Bhusan, the prominent Lawyer-turned activist, he is a tireless fighter for Public Causes and also the son of the veteran lawyer father, Shanti Bhushan who is also a founding member of the Anna Hazare’s India Against Corruption movement, he donated a whopping Rs.one crore as donation and the others like the South (Bangalore-based) Captain Gopinath and also others, mostly ladies, Shazia Illmi and Anjali Damania from Nagpur, one or two other prominent women leaders from Mumbai and even from Delhi have disassociated with Mr.Kejriwal within this short period of time. Now, the PAC met on Wednesday (4, March, 2015) and deliberated the crisis. 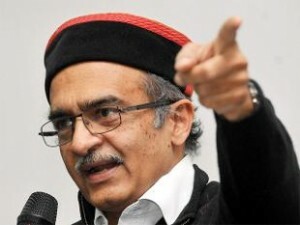 The new PAC sought to diffuse the crisis by asking, after a five and half hour of debate, both Mr.Bhushan and Yogendra Yana, an academic turned politician, who also contested the Lok Sabha election and lost. Both are intellectually competent and a shade above the rest of the crowd around Kejriwal. The two refused to resign on their own and called for a vote. According to reports, the actual numbers who were present were just 19, Mr.Kejriwal who was in Delhi and yet absented himself and also sent in his letter of resignation as a national convenor of the party. In the actual voting, it was just 11 who voted against the duo, the 8 voted for the two. And considering the party is new and its remembers are young, it is natural to ask why a good number of 8 voted against Mr.Kejriwal’s wish to see himself supreme? Unfortunately for the Indian media and commentators, they all seem to be steeped in the Indian mindset. All the TV channels and newspapers reported as if it was a defeat for the two founding members of the AAP and it was victory for Kejriwal for absolute power! It was neither. It is here we like to add some clarifications. First, the AAP party has not had any clearly spelt out ideology or any basic framework of a political alternative to the existing parties. AAP made certain promises like clean politics. It grew out of the India against Corruption movement of Anna Hazare. 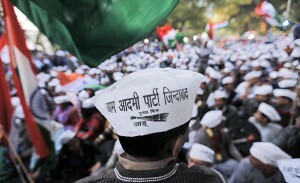 Mr.Kejriwal of course brought Anna to national capital and in a sense to national attention in a prominent way. At that point of time, it was Lokpal that was the only agenda. Political ambition was absent. Then suddenly Kejriwal developed his own ideas and started a political party to act upon his ideals and vision. It was left to many in the party to articulate the ideals of the party. Clean politics again. Fighting corruption, transparency in running the party, transparency in election funding, delivery of public services by promising reduction in tariff for water and electricity, regularisation of unauthorised colonies etc. Now, the two leaders. Mr.Bhusan and Yadav had, it seems, raised some questions like one-man centric power wielding by Mr.Kejriwal. Admiral (retd.) Ramadass is the internal Lokpal for the AAP. He himself raised the issue of one-man one post issues. So, there is no discussion on this issue at the PAC meeting. Also, Mr.Bhusan raised the receiving by the party of four cheques from anonymous donors for Rs.2 crore in total. Nor the issue of transparency and even an indication of willingness on the part of Kejriwal to consult and exchange views among the top, senior, founding members were seen all these days when they were in power. It is this aspect that seems troubling at the inner circles of the party. Mr.Kejriwal seems to have a track record for doing things in a highly arbitrary manner. He cultivates and ditches people, it seems. He has a long story to tell! The very many young women who were drawn by his idealism are now left in the dark. We don’t see any representation of women either in the party or in the government. This, in our view, is a serious lacuna. Also, there is no room for articulation of an over-arching ideology or vision. It is all now back to power and perks, it seems. It was often left to Yadav to paint a big picture for the party. Now, he is dsidelined.What is Mr.Yadav’s grouse? What is Mr.Bhushan’s grivance? No way to know. To report in the press as if the duo were expelled. A success for Kejriwal? Mr.Kejriwal ousted his opponents as if both Mr.Modi ousted Mr.Sanjay Joshi in the BJP or Sonia Gandhi ousted all opposition to Mr.Rahul Gandhi. This type of media reports lowers the image of the AAP. It is time someone from within the AAP to hasten to correct this image distortion. Surely, the AAP can’t behave like the Congress or the BJP. Hero-worship, sycophancy is the last thing people like to see associated with the AAP. One last word. Ideological issues or personal ego clashes? 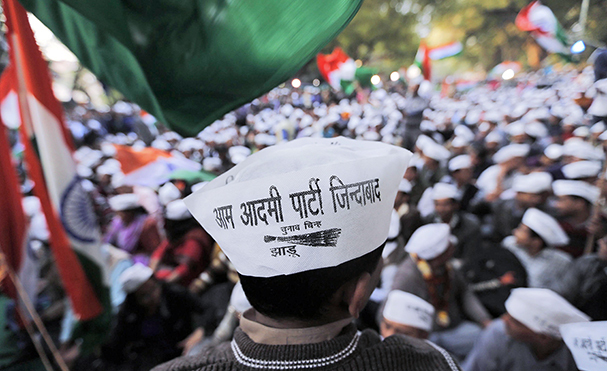 In our considered opinion, it is the lack of a deeply-felt ideology that is absent in the AAP. First, Mr.Kejriwal himself, on the ideological front, in our view, is an unknown quantity, if we can say so. When Anna Hazare started the India against Corruption movement, the first big donor, it was said at that time, was a known Hindutva bigsot. Right or wrong? The RSS was behind it. Right or wrong? When Kejriwal organised the Ramlila Maida fast of Anna, there were personalities linked to RSS, Ramdev and others. Right or wrong? Now, in a hurry to capture power, the AAP promised all things to all men, including those within the party. Kejriwal practised populism with a vengeance, right? History, at least from Hitler onwards, shows any extreme populism, any promise of paradise, carries with it many dangers; fascism is not the least dangerous. Is Mr.Kejriwal a leftist or an ultra-left, as his admirers criticise his estranged colleague or colleagues. Or, what is Kejriwal’s ideology? What are his political and economic crore beliefs? What vision has he, if at all for India? For this generation of youngmen and women who gathered around him? It is only fair if we ask him to spell our his vision in brief. His attitude towards BJP, Congress, the two major national parties? His commitment to democracy, economic ideology, secularism? In this terrorism-stricken world, surely for a country of India’s dimensions, its religious and social polarisations, what is Kejriwals’s attitude towards communal polarisation as a political and electoral strategy. Finally, one lingering question: is he really driven by any vision at all? Or, is it simply a personal ambition or ego play? Politics everywhere is vitiated by personal ambitions or power-addiction or authoritarianist tendencies. Why, even ,simple small-minded petty egos. We see these things before our very own eyes, nearer at home! Surely, the time has to come to ask such rather inconvenient questions. If not we, we are sure, such questions would be asked by his own estranged rivals for sure! Very soon! Once in power, it is natural, human only to expect they, the winners are rewarded suitably. This, may be, Mr.Kejriwal failed to do. May be he feels he is supreme. This is simply wrong and he is mistaken, if he thinks so. As it is said by the AAP insiders, the intellectual strength of the AAP is now weakened by the ouster of the two highly competent leaders. This is also the sure way for a faster downfall. Every politician in India seems to fall for this trap. The current dynastic political culture that is gripping the players, from Sonia Gandhi to others like the DMK,SJP,SAD to Paswan to others had given the mindset of a feudal lineage in modern democratic politics. The BJP may not have a dynastic disease today. But it has the danger of authoritarian power growing. The other parties, big and small, small like the AAP or the older and regional ones like the DMK are caught by the various other diseases like inflated egos or sheer cynical dynastic narrow-mindedness. The Congress is the biggest threat to the evolution of genuine democratic norms in the Indian polity. We have to learn to practise democratic political culture. This calls for articulation of an ideology and vision. And more than anything else, a certain personality, certain humility and truthfulness in our dealings. These are of course very rare traits indeed. And also you need a certain personal charisma and self-dignity. A belief in yourself! To consult and reach consensus calls for men and women of great sagacity. There is a dearth of this rare leadership in the Indian political scenario. A cause for deeper worry.